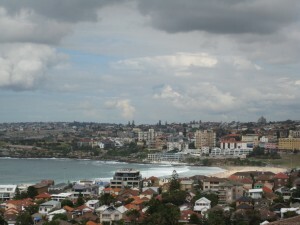 I expect that when most people think about Bondi they’re thinking of the beach area, or of the Campbell parade area. For me, “Bondi” is actually quite a large area. Although a lot of things in this blog may be primarily concerned with the Beach area of Bondi, when I’m imagining Bondi, I‘m not just thinking about Bondi Beach. I’m referring to an area that spans beyond the beach area, and also beyond North and South Bondi. For me, Bondi’s borders span from Dover Heights to Rose Bay to Paddington/Woollahra to Waverley to Bellevue Hill to Bronte. I know that strictly speaking this area is not exactly “Bondi” but this area is my Bondi, my stomping ground. I’ll try and illustrate what I’m trying to say here…when I lived in Sydney’s inner west, in Newtown, for about 1 year in the early 1990s, I used to feel rather out-of sorts when I hadn’t been down to Bondi for days on end, sometimes a couple of weeks or so. I’d get a bit antsy and have to get myself over to Bondi. So I’d be driving from Newtown towards Bondi and I remember very clearly that when I reached a particular spot on the journey I would then feel like I was back in Bondi. That spot was on Birrell St heading down the hill , towards the beach, a little ways past where Waverley College stands. I’d get to that point where I could suddenly see the ocean and I’d just take in a deep breath and feel a warm, fuzzy feeling knowing I was back in Bondi. Great picture, love the clouds. Hey, I read a book a couple of years ago about an Australian guy and a New York guy entitled “Keep Australia on Your Left” or some such. They attempted to paddle around Australia in a Klepper tandem folding kayak. Anyway, I think I recall they launched from Bondi Beach. Thanks for your comments Christov10. I haven’t heard about that book but sounds like it would have been a good publicity stunt to leave from Bondi Beach. Your are so right. I really need to get down to Bondi Beach, at least once a week, for a walk/coffee or even would you believe a drive thru., to get my fill. Something always beckons me to get down there, it’s just a feeling I can’t describe. Whether it’s linked to growing up in the area, or just a vibe I pick up when I’m there, I honestly can’t say. All I know is I feel much better for getting down there and miss it if sometimes I can’t. The Eastern Suburbs in general, is still a nice place to be. It’s home. I’m sure having the connection to a place from growing up there, especially if it is a beautiful place, plays a big part in making us feel good about being there.